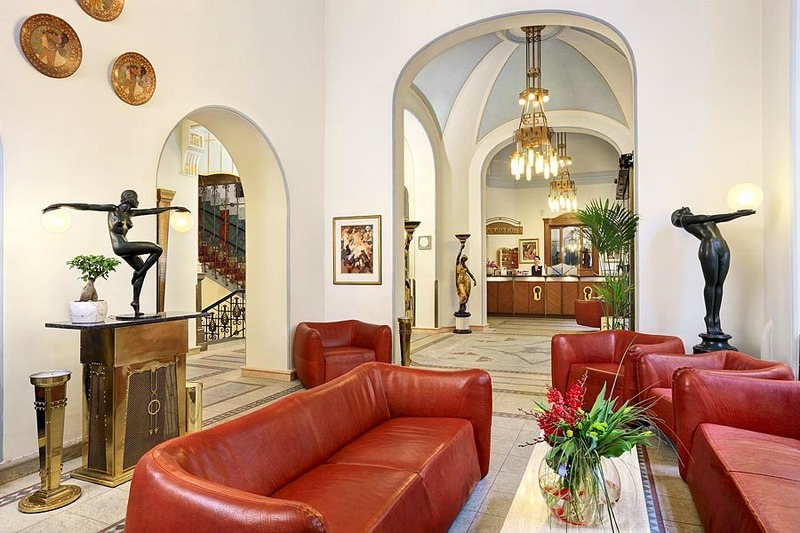 Just beside the Municipal House and a couple blocks from the Old Town Square, the Art Nouveau Hotel Paris is located in the most historic area of Prague. 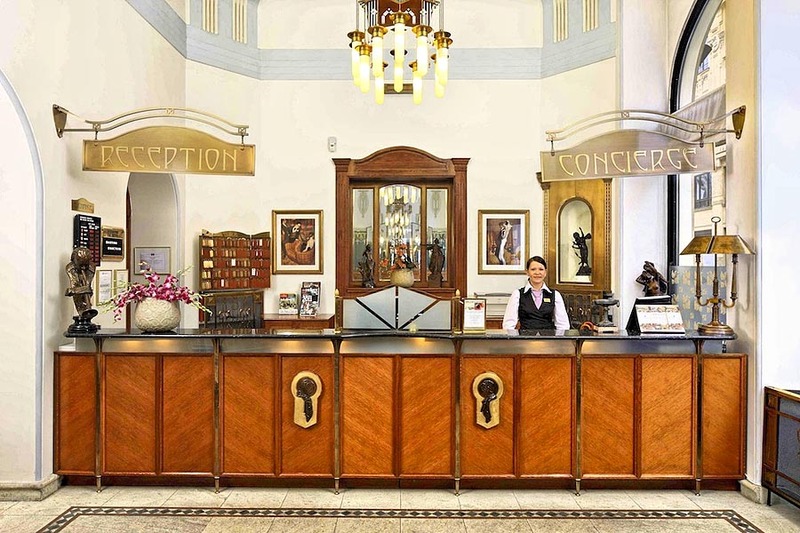 As a visitor you will enjoy access to many interesting historic sight, stores, galleries and restaurants within steps of the Hotel. 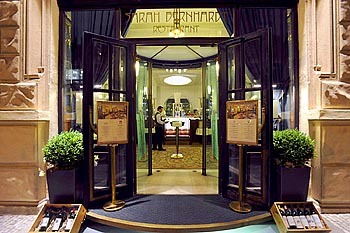 The Hotel Paris is located in the main pedestrian area but it is also easily reachable by car. 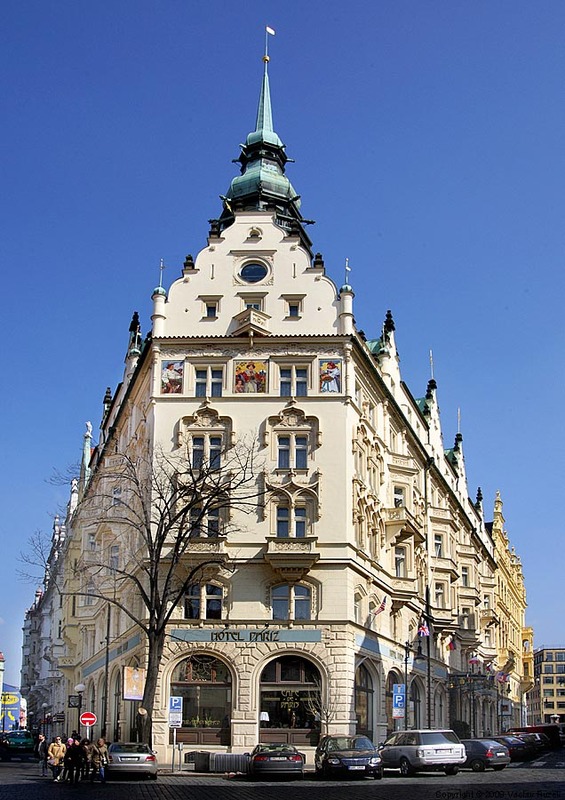 Next to Hotel Paris is underground station Namesti Republiky (line B) and tram stops (No. 5, 8, 14). Distance from the Intl Airport Ruzyne is 16 km / 11 miles and it takes approximately 30 minutes by car. 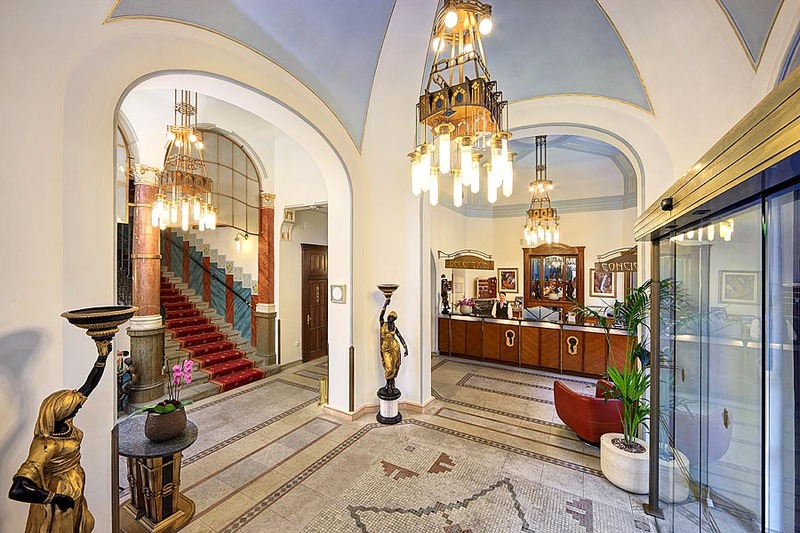 Our hotel was built in 1904 by well-known architect Jan Vejrych; interiors were designed by A. Pfeifer and ceramic mosaics by J. Köhler. 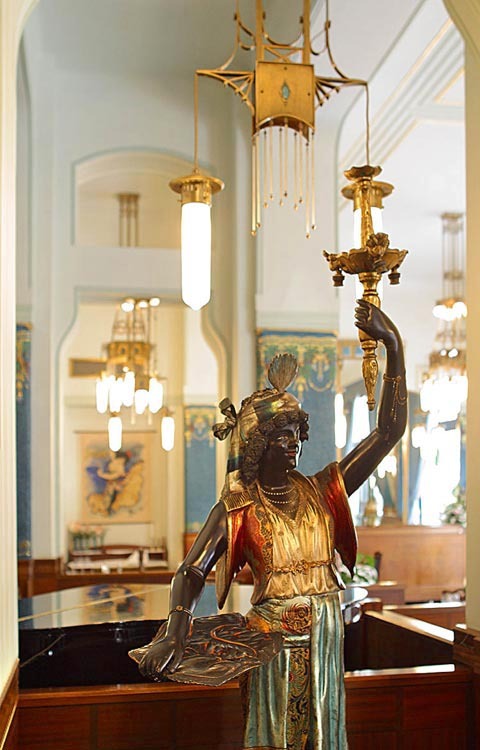 Even more than 100 years already passed, the Hotel retains its singular style and beauty of the Art Nouveau era. 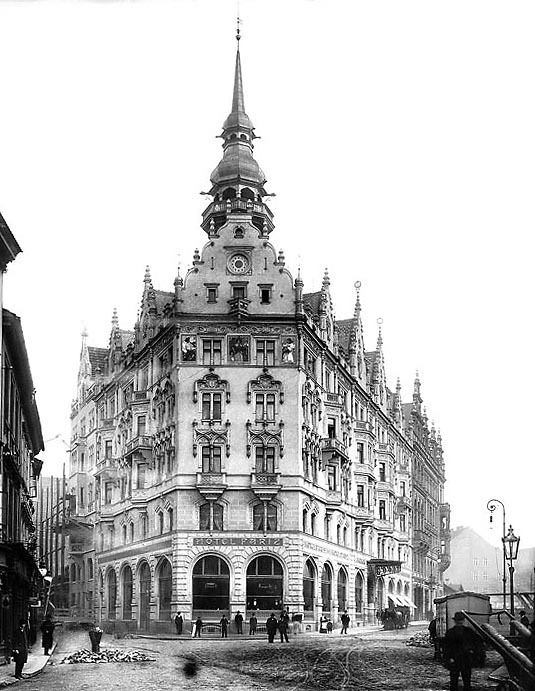 Before communist’s era the Hotel functioned as the city’s distinct attribute of traditional wealth. 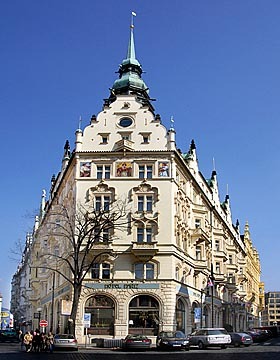 In 1984 the Hotel was declared a historical monument and so deservedly then belongs among other the most remarkable Prague sights. 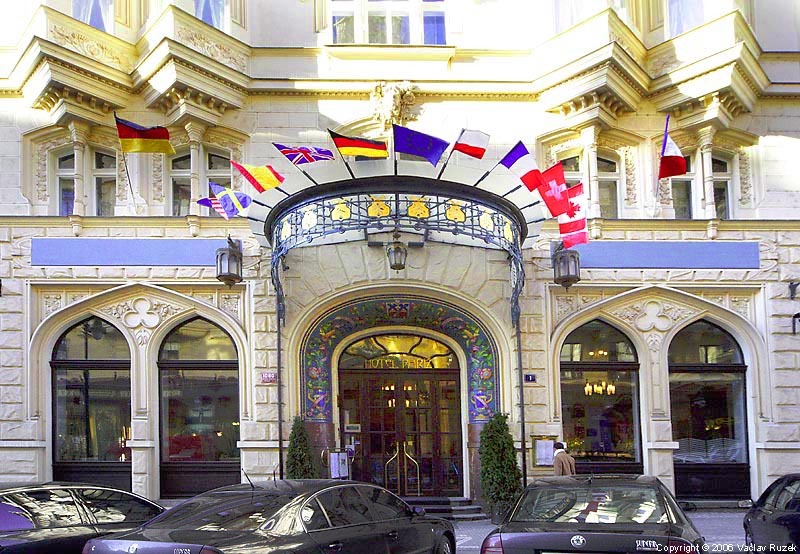 After the Velvet Revolution, in 1991, the government returned the Hotel in the restitution process to its original owner, the Brandejs Family, being in the hotel business for already over 150 years. 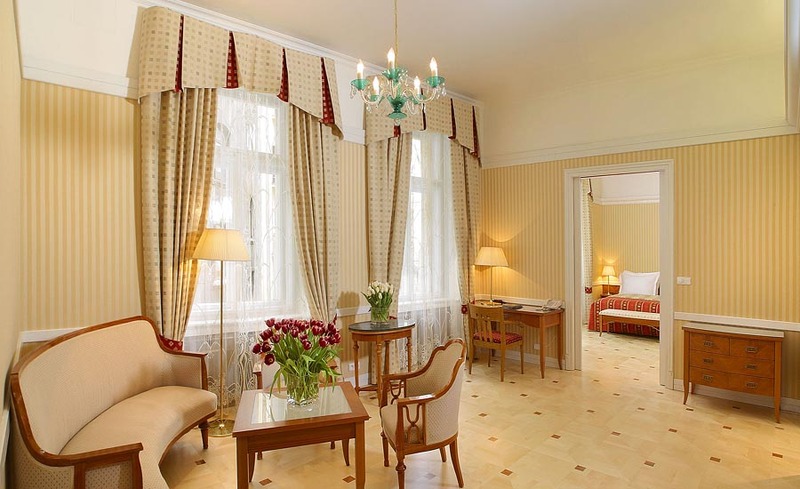 Our Hotel offers in total 86 elegantly appointed guest rooms, uniquely styled and sized, including 11 luxurious Junior Suites, and 3 Apartments. Each room is handsomely decorated and furnished with replicas of the original furniture, so no matter which room you choose to stay in, you will have the feeling of returning to the picturesque Art Nouveau era. 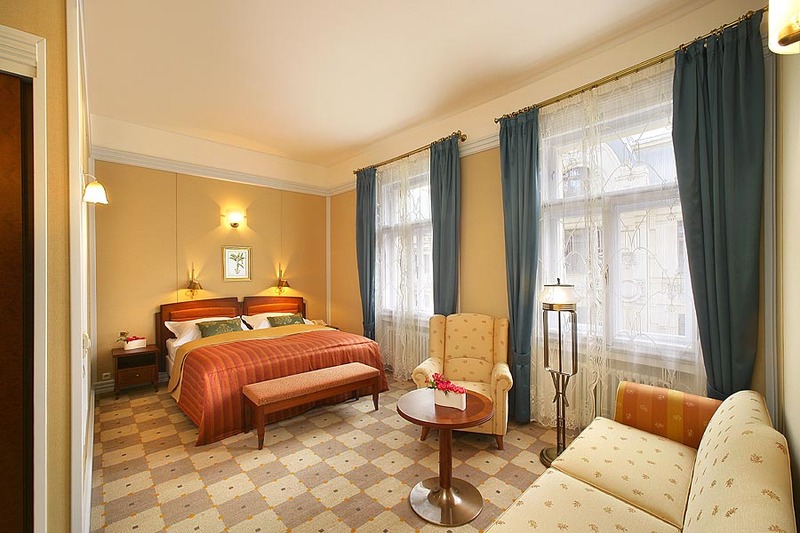 Hotel guests are invited to choose from the following categories: Deluxe Room, Executive Room, Executive Suite, Junior Suite, and Apartments: Klimt Suite, Mucha Suite & Tower Suite. The air-conditioned sound proof rooms are equipped with a direct dial telephone with voice mail, Wi-Fi internet connection, remote control satellite TV, Pay TV, mini bar, safe, smoke detector, and individual climate control. 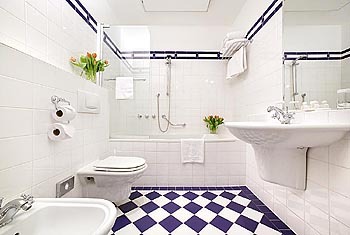 Luxury full size bathrooms with heated floors are equipped with hairdryers, massage showers, bathrobes, cosmetic mirrors, and sets. 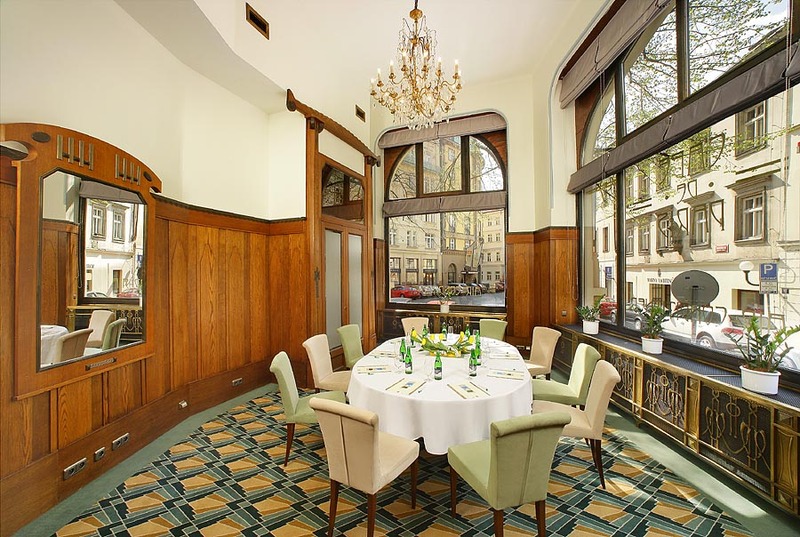 Our guest rooms combine Art Nouveau elegance with the latest technology, so whether you are in Prague to work, play, or relax, you can do it in style. 48 elegantly comfortable and fully-equipped. 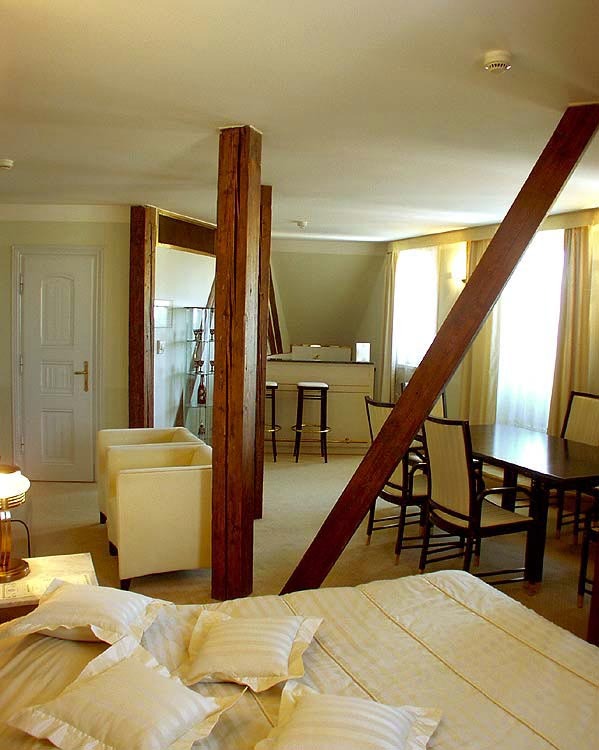 King-size beds, twin beds, an extra bed can be added, comfortable armchairs with a coffee table, desk and spacious wardrobe. 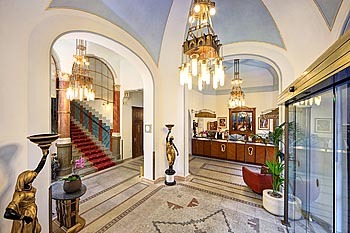 Some rooms have balconies with a view of the Municipal House and Prague city centre. 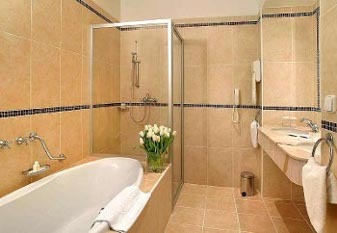 The bathrooms with comfortable floor heating are equipped with bath or shower, toilet and bidet. 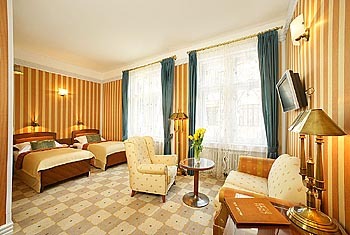 The approximate room area is 22 sq m.
22 Executive rooms are more luxurious than the Deluxe rooms. 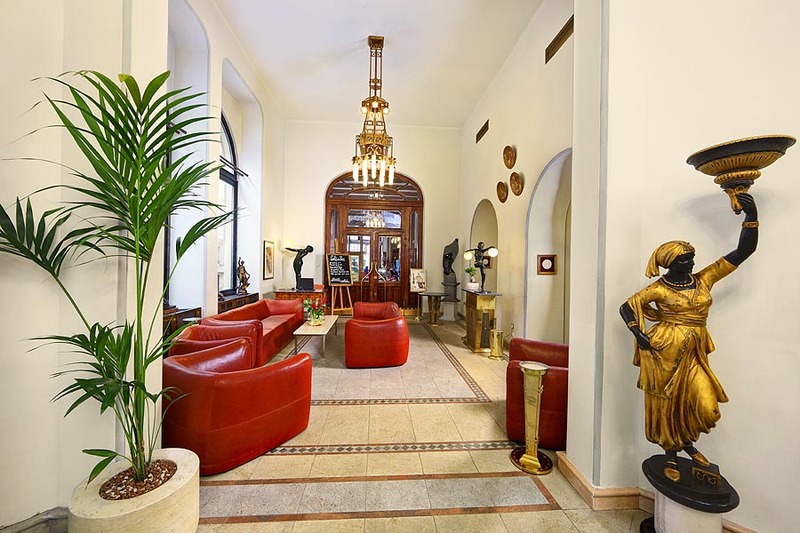 The furnishings and facilities are very similar, the main difference consisting of the location in the hotel, which are in the corner boosting a splendid view of Prague Old Town. 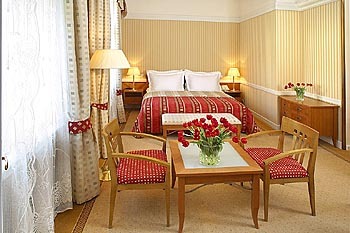 Rooms are more spacious and have either a king-size bed or twin beds, an extra bed can be added. 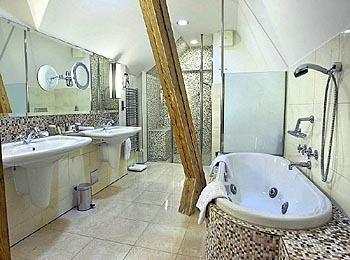 The bathrooms with comfortable floor heating are equipped with bath or shower, toilet and bidet. The room area is approximately 25  30 sq m.
13 spacious and elegantly-furnished Junior Suites in Art Nouveau style. Suites are furnished with large king size bed and comfortable sofa. 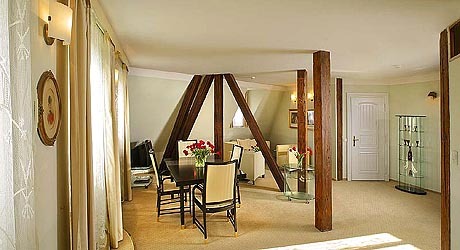 The room also contains a desk, coffee table and armchairs, wool carpet and a generally elegant and pleasant atmosphere. 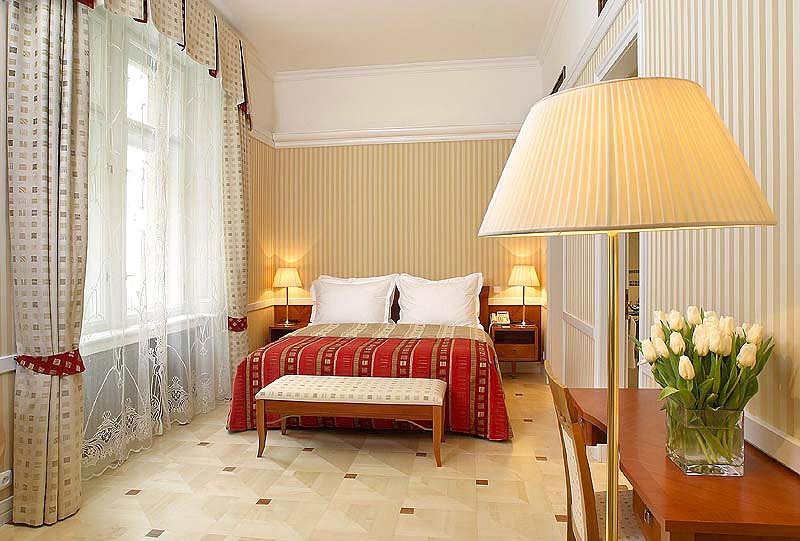 Junior Suites is enhanced by their spaciousness and luxury furnishings and facilities. The bathroom with floor heating will certainly meet your highest expectations  double marble washbasin, bath with massage shower, fan, telephone, cosmetic mirror, bathrobes; toilet is separate. The room area is approximately 35 sq m.
The Klimt Suite is one of the most attractive suites with Art Nouveau decorations. The spacious and comfortably furnished suite has a king-size bed, a sofa table and cosmetic table in the bedroom, coffee table with armchairs and a sofa, TV corner and a desk in the living room, two dressing rooms. The bathroom with separate toilette will meet even your most demanding expectations - double marble washbasin, bath with massage shower, fan, telephone, cosmetic mirror, bathrobes. 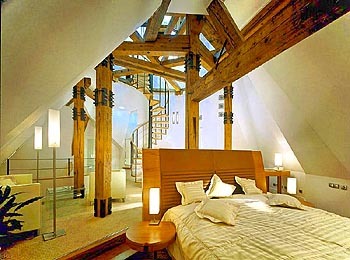 The suites area is 60 sq m.
With unique view of Prague Old Town and Prague Castle. Suite is located on the highest floor of Hotel Paris, right by the tower, which adds a unique atmosphere to the room. Suite is furnished with a king size bed, coffee table with sofa and armchairs, table which can also be used for smaller meetings and kitchenette with bar. 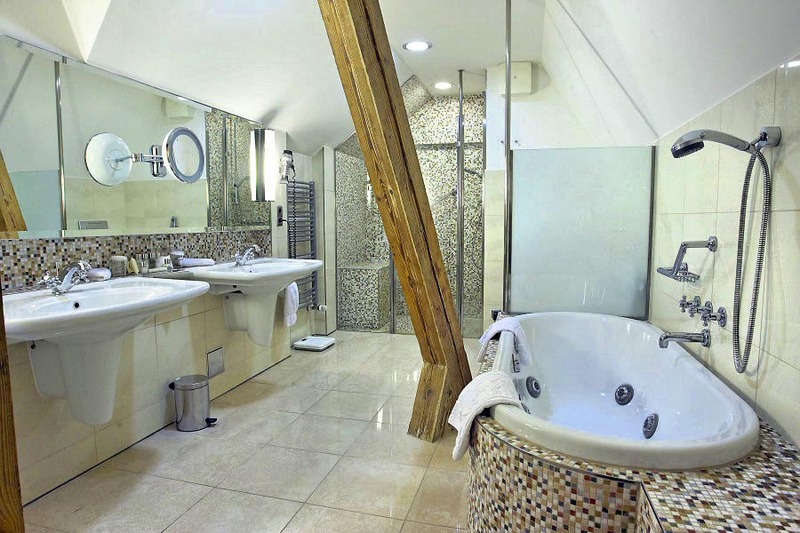 The suites area is 40 sq m. The bathroom has heated floor and is fully-equipped with bath, cosmetic mirror, toilet, and naturally bathrobes, fan and luxury toiletries as well. 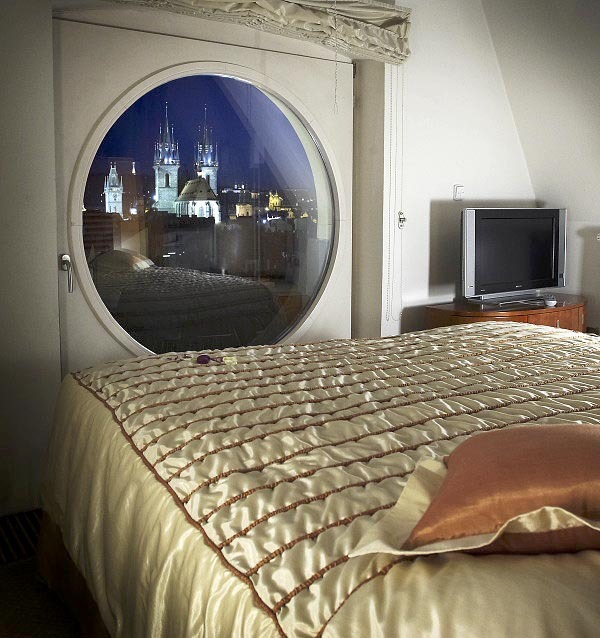 The Tower Suite is a unique room providing an exclusive 360° view of Prague historical center. Right from the comfort of your bed you can see roofs of Prague Old Town and Prague Castle. 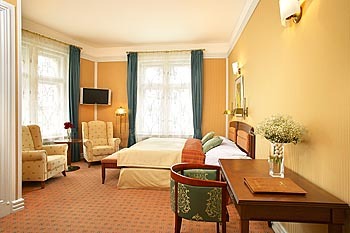 Suite is furnished with king size bed, coffee table with sofa and armchairs, table and dressing room. 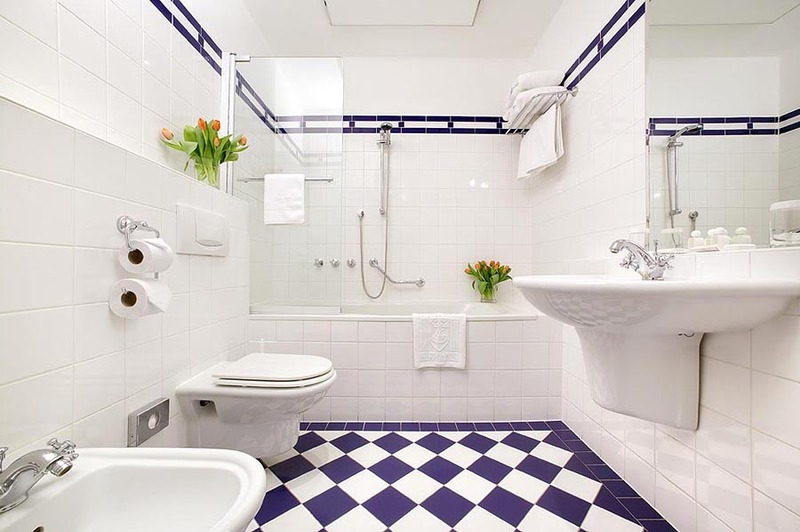 The bathroom is fully-equipped with heated floor, double washbasin, cosmetic mirror, bath with Whirlpool system and massage shower enclosure, bidet, toilet and of course bathrobes, fan and toiletries as well. The suites area is 50 sq m.
Famous gastronomical pearl in Prague. 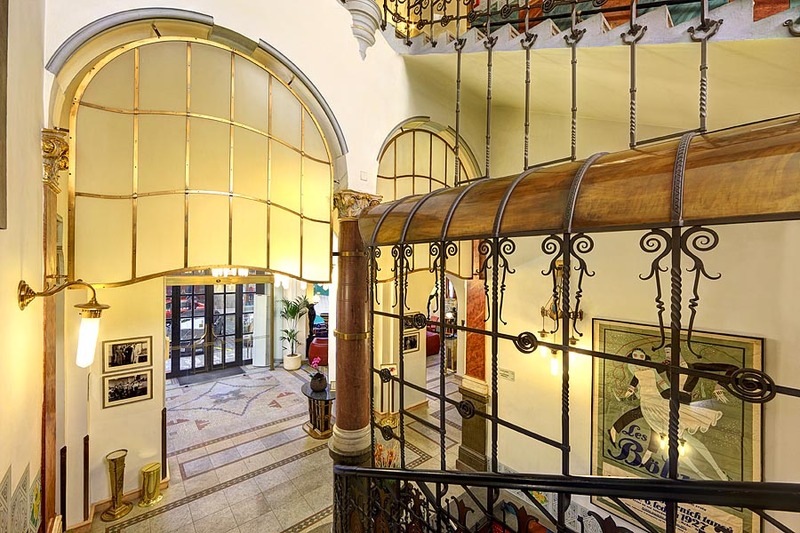 Exquisite architectural gem named by the actress and singer Sarah Bernhardt. Exclusive and romantic atmosphere. 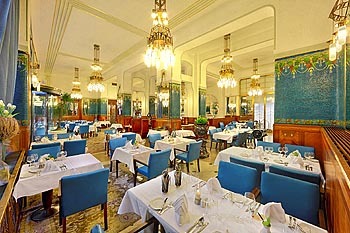 Open daily for breakfast from 6:30 AM until 10 AM. 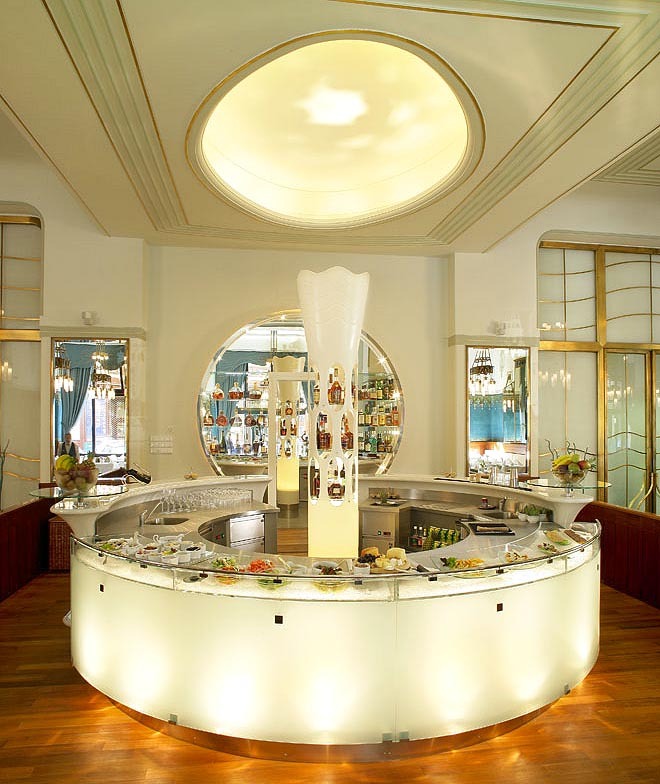 Open daily for a la carte dinner from 6 PM until 11 PM. 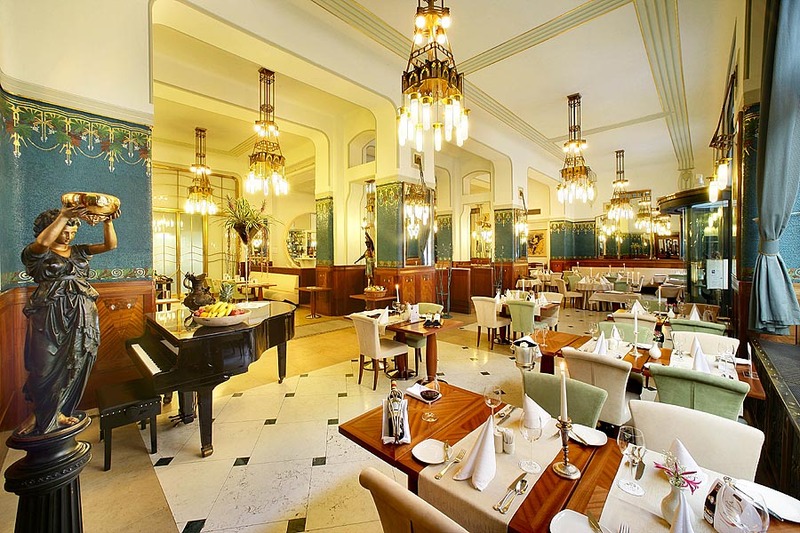 French and traditional Czech cuisine prepared by Chef Mr. Karel Hynek and his team. 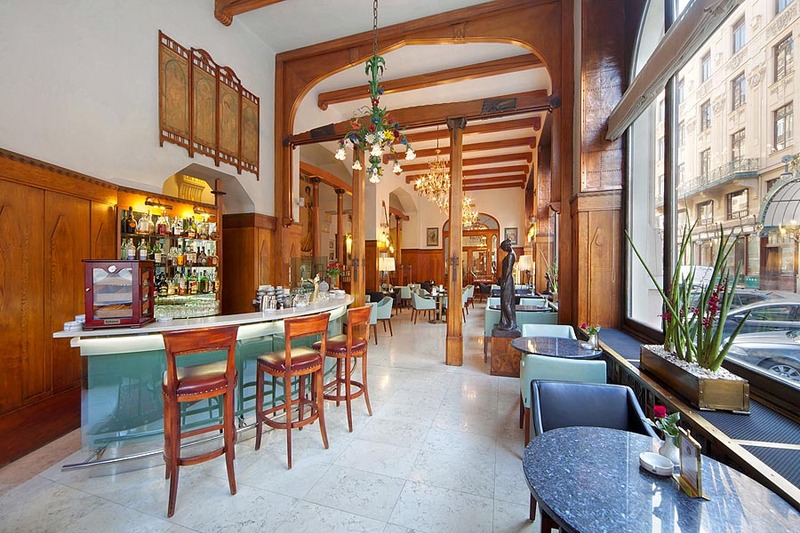 Le Vin de Paris wine bar offers a wide range of quality Moravian and French wines. Delicious seasonal offers and room service 24 hrs daily. Perfectly resembles the real look and atmosphere of a Parisian café. Situated in the heart of Prague. The best place for a meeting with your friends or business partners. Free Wi-fi service of the comfort your seat. Open daily 8:00 AM - 2:00 AM. 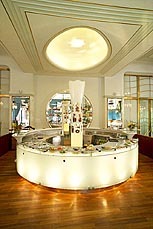 Wide selection of delicious dishes & snacks & home made cakes. Freshly prepared in our kitchen on request. 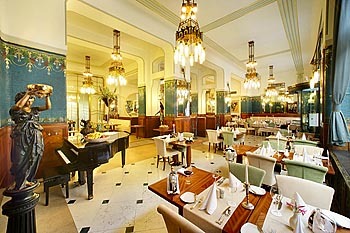 Wide selection of drinks includes a range of teas, freshly brewed coffee, juices, sodas, liquor and house wines. Quick lunch from 195 CZK. 2-course light lunch menu incl. soft drinks from 340CZK. 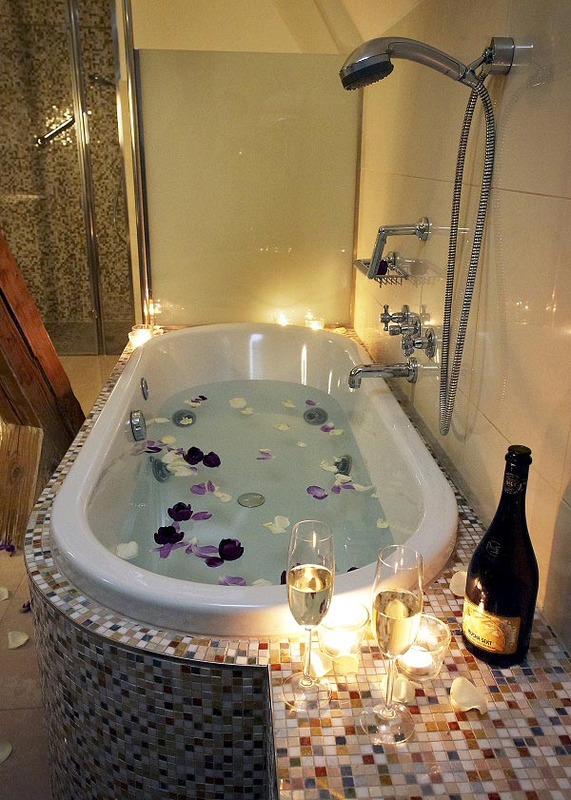 The most pleasant and charming place for resting and relaxing. 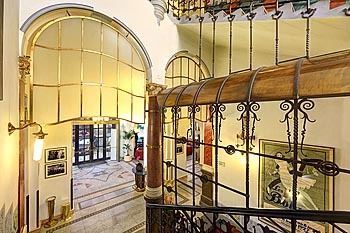 Entry to Hotel Paris Wellness & Spa Centre is FREE for hotel guests. 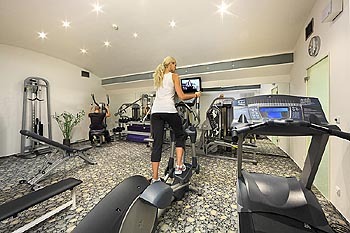 Private reservation of the Wellness & Spa Centre is available for CZK 1500/hour, for max. 6 persons. Thai massages for extra charge. Open daily from 4 PM to 9 PM. 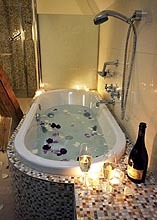 Facilities include: Sauna, Cooling pool, Jacuzzi, Steam Bath, Massage Shower, Fitness centre. 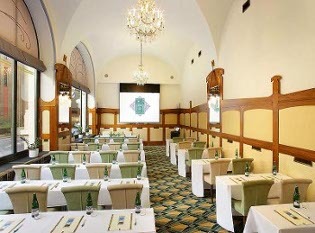 Salon Violet & Petit are the perfect solution for conferences, business meetings or private parties. Salons are located on the ground floor of the Hotel, next to the Café de Paris. 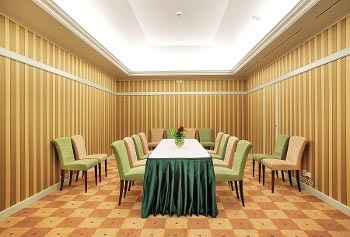 Both meeting rooms with natural light are fully carpeted & sound proof. Wi-fi connection. Offer of favourable conference packages. Capacity is max. 55 persons. 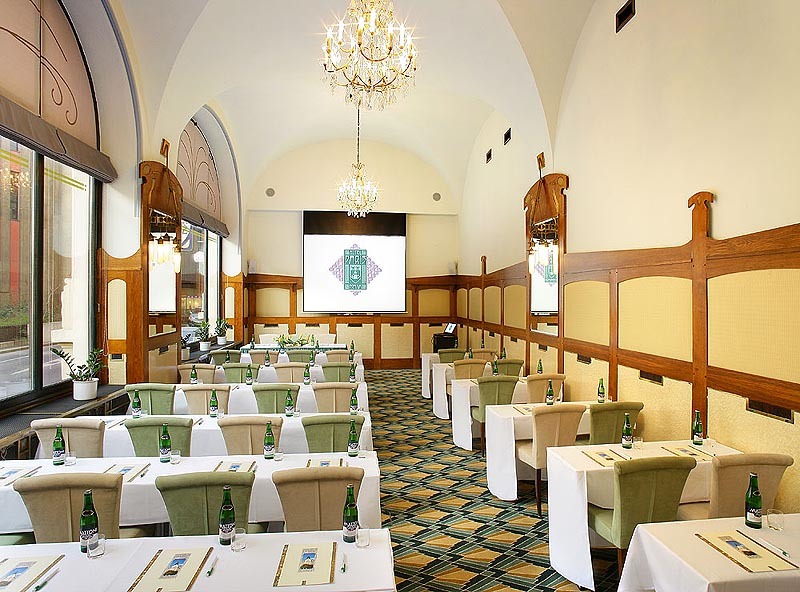 Perfectly suited for hotel conferences, meetings and other business. Refreshments and necessary technical equipment are available. Direct daylight and absolute darkness can be provided if needed. Salon is located on the ground floor of Hotel Paris. 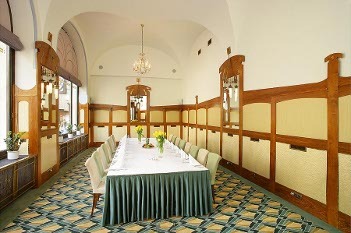 For more individually oriented meetings  up to 20 persons. 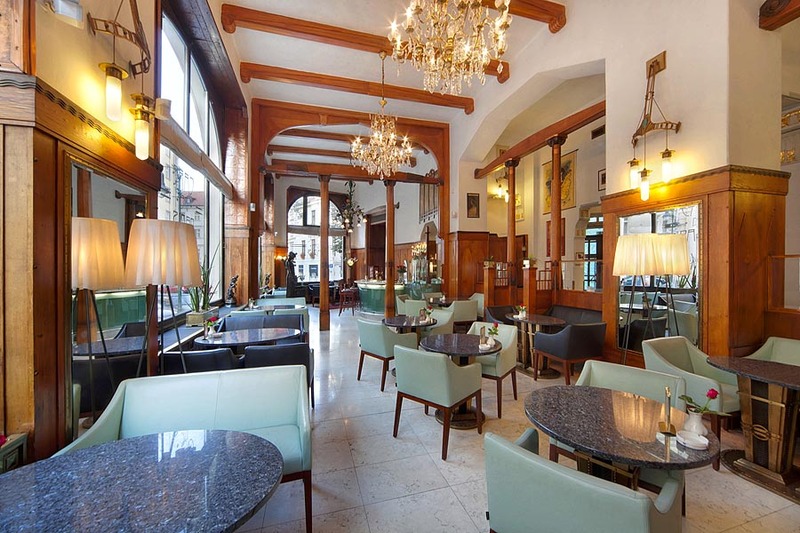 Salon is located across from the Violet Salon conference room, right at the front of Hotel Paris building. Thus two of its four walls are glassed-in, but it is not a problem for absolute darkness to be arranged if necessary. Refreshments and essential technical equipment are available. 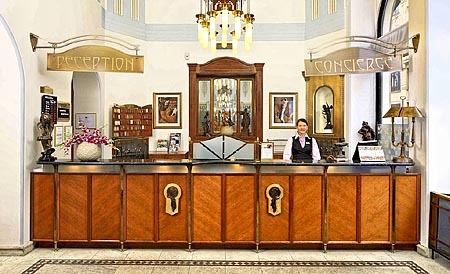 We pay full attention to detail for your full day of business. 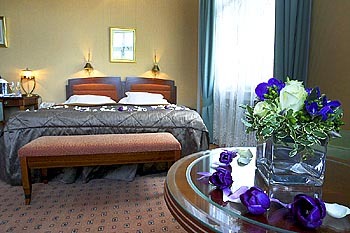 We offer last minute discount 10% - 48 hours before arrival. These special prices are valid for all reservations prepaid 2 days or more in advance. 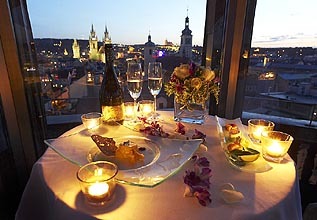 but do not include city tax 0,6 EUR person/night. 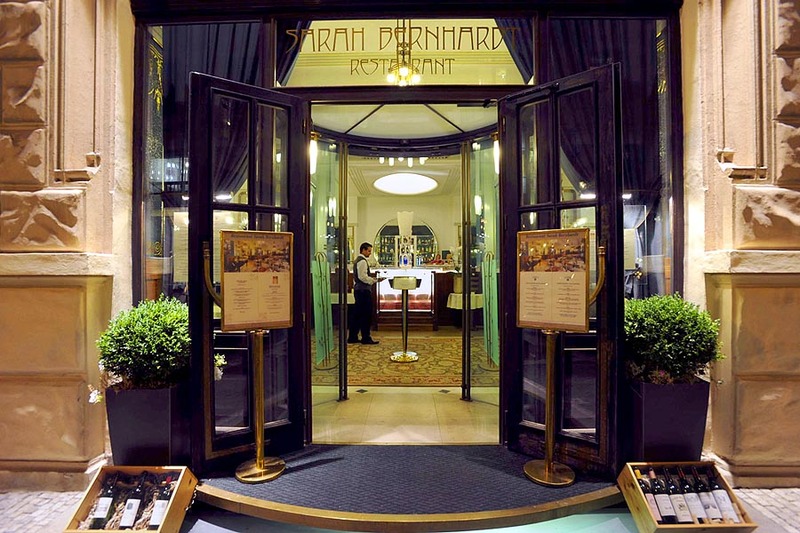 New Year's Eve programme "Sarah Bernhardt" for 245,- EUR per person is obligatory. Extra bed ... 60 EUR. Extra bed for children under 12 years free. 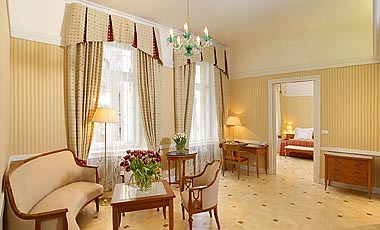 Mucha and Royal Tower Suite are for 2 persons maximum. All other rooms are for 3 persons maximum. Price for single use is the same as double use.